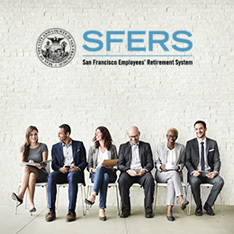 The Retirement Board of the San Francisco Employees’ Retirement System welcomes San Francisco Assessor Carmen Chu as its newest member. Assessor Chu has served the City and County of San Francisco for over a decade and has held positions as the Deputy Director of the Mayor’s Office of Public Policy and Finance, member of the San Francisco Board of Supervisors and now as the elected Assessor for San Francisco. Read full release here.